I love the look of these weird dummy boats tethered on the Spree River. They look like place holders for the real thing, soon to be installed. Reminds me of the artist Rachael Whitread’s ‘House’ sculpture, where negative space is cast as a neutral solid. 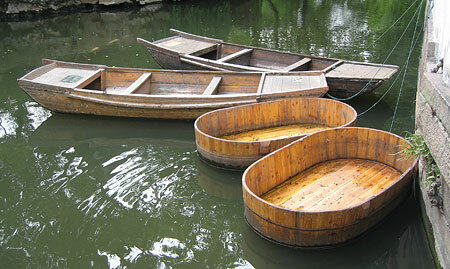 Compare them to these charming wooden bath-tub boats I saw this September in the ‘Humble Administrator’s Garden’ in the city of Suzhou, China.